This is the third part in a series about healing a brain that has been changed due to trauma. The first part focused on PTSD and the second part focused on the use of a Soulcollage in healing. I received this information at a wonderful retreat at Mercy Center, where we explored ways to heal brains damaged through traumatic experiences, using breathing exercises and spiritual formation exercises. Our group leaders were Sandra Lommasson , founder of Bread of Life in Sacramento, and Tanda Ainsworth who is a retiring USF professor and brain trauma expert. Today, we will talk about breathing. Most people who have experienced a traumatic event have trouble breathing well. Most of us take shallow, rapid breaths that don’t get the air into the deeper parts of our lungs. This kind of rapid and shallow breathing gets oxygen to your arms and legs so you can run or fight, but leaves us low on oxygen when we are not exerting ourselves. Calming hormones produced in the gut when we breathe deeply aren’t released and logical thought is compromised. When trauma happens, especially if it happens over time, cortisol, a stress hormone, is released. This hormone, which is helpful in small doses, can be toxic to the body over long periods of time. It can actually change the shape of the brain. The good news is research shows the brain can be healed and most of this healing can take place through learning to breathe. For helpful information on this topic, explore the website of brain expert Dr. Daniel Amen. Tanda said that 80% of the patients that come to Dr. Amen with trauma brains leave completely healed. That is an amazing statistic. Our brains can heal themselves through breathing, eating well, exercise and spiritual care. There is hope for a traumatized brain! Proper breathing gets the sympathetic nervous system and the parasympathetic nervous system back into balance. This balance lowers cortisol and allows your trauma affected brain to heal, and this balance allows the amygdala (which controls our fight/flight response) to shrink to its normal size. At our retreat we practiced several breathing techniques. These were really hard for me to do but I’m going to practice them and hopefully allow my brain to heal. First, time your normal breathing for one minute. Count each inhalation and each exhalation as one. (Stop and do that now). Most people breathe between 12 to 20 times a minute. I came in at 19. The goal is not only to learn to breathe more slowly, but also to make your exhalations twice as long as your inhalations. Breathe in through your nose and out through your mouth, as through a straw. 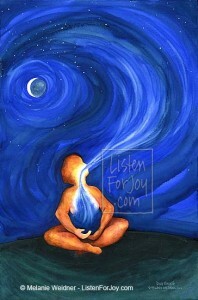 Try it again and see if you can make your exhale last twice as long as your inhale. I had a hard time with that. Go on a slow walk and take a breath in as you count your steps. Make it a goal to add one extra step on your exhale. 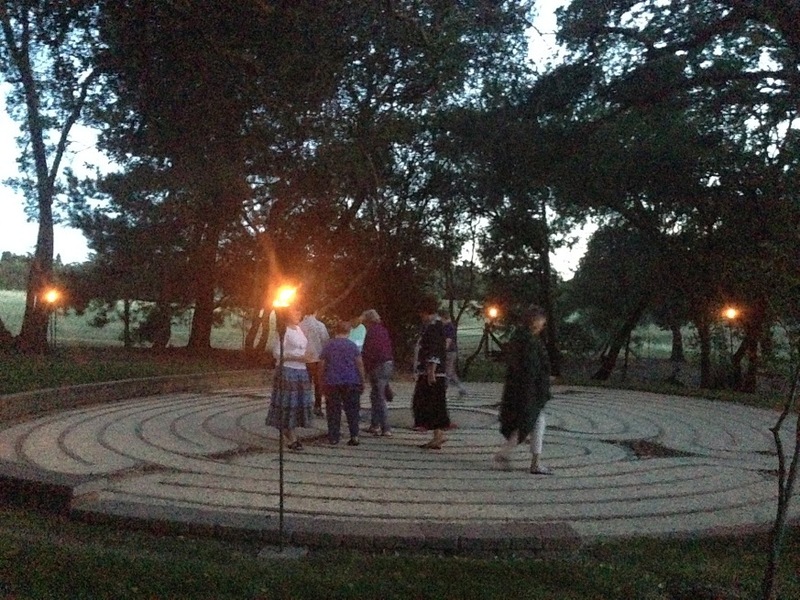 We did this while walking the labyrinth at night. It was a wonderful communal experience. One thing I learned at this retreat was the importance of community in healing trauma. It is the “Wherever two or more are gathered, there am I in your midst” principal. Don’t try to walk this road alone. Find fellow travelers to walk it with you. Grief or trauma survivor groups, therapy, spiritual direction…find or start a group to walk the healing journey together. I’ve been teasing out hints about a new direction I’m taking as a result of this retreat and I’m ready to share it now. I want to bring this kind of spiritual formation education to Northern Nevada where I live. I’ve been so blessed by the training I’ve received as a Marriage and Family Therapist, a Spiritual Director and a Campus Minister and I’ve attended wonderful conferences, but none of them are available locally. Now it’s time to give back. I will be starting: The Shalom Center for Spiritual Formation. I will start by offering four or five retreats a year and see how it goes. I envision: A grief retreat, a trauma retreat, a couples retreat and a prayer retreat. I’m so excited! Those whose wisdom I trust have encouraged me in this vision, saying it is a perfect fit for my gifts. My commitment to bringing a healing LGBTQ community to the church will continue, as well as my writing and my hospice service. But I’m very excited about this new adventure and and I would appreciate prayers and positive thoughts. Do you have trouble with breathing? What ways have you found to help breathe more deeply? Way to go, Jacci! Another great post, and timely for me. I’ve forwarded it on to some people, in hopes of accelerating their healing. Thanks, and keep up the good work. Thanks dan! And for the shares. Praying for your healing! Jacci! So much excitement! First off, thanks for sharing the information about breathing exercises! I have difficulty getting many of my clients to do them because they don’t understand how important they are…perceived more as a hippie meditation thing. Thanks for more information to help me help them understand the biology behind it. Also…the retreat thing center sounds amazing! I have been praying and thinking alot about a retreat center in our area since there really isn’t one and especially with the rich spiritual and intellectual resources we have around us! Maybe some day in the future we can partner! I use an app called Mindfulness Bell – I can set it to ring randomly at approximately 15 minute or 30 minute intervals. When I hear the chime, I take a couple moments to breathe deeply. I use the breathing to stimulate my lymphatic system, (many lymph nodes in the belly) to help support lymphedema which I developed after a mastectomy. Wow, what a great idea. Thanks for sharing thst! Thank you for sharing that story. Perhaps you can write about what you did in those twenty years that created that safety net. We can learn from that! I will definitely take you up on that writing assignment!